Ever wish that you had a fast-acting, accurate hand held thermometer? One that's versatile and can be used when smoking meat, and also's great for most kitchen cooking? Tired of your smoker losing its heat as you lose your cool, waiting for that slooowwwww thermometer of yours to hit that final number? 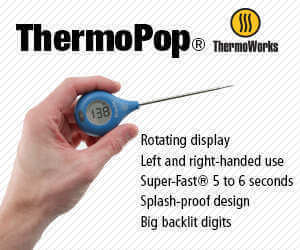 The ThermoWorks ThermoPop could be the thermometer that fills those needs. When your meat smoker's open it loses heat. By using a fast-acting thermometer heat loss is minimized when checking temperatures. Less heat loss means your smoked foods will finish cooking quicker. I purchased my ThermoPop TX-3100-RD over six months ago and it's performed very well. Both accurate and fast, it's comfortable in the hand and easy to read. I use it when smoking meats and when I'm in the kitchen. 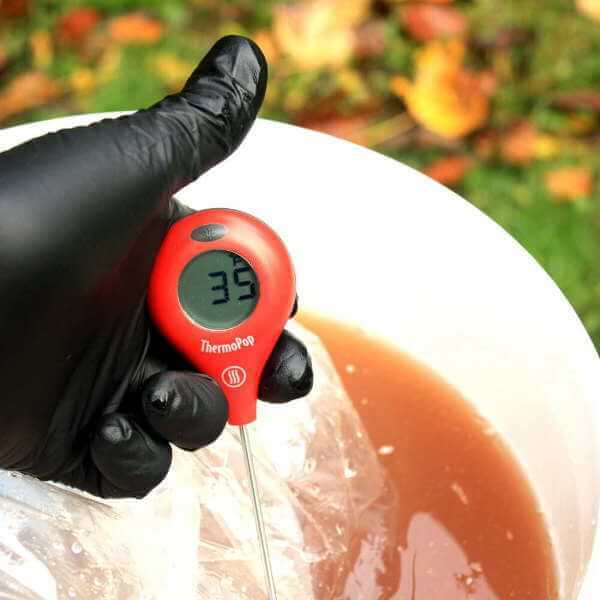 There are a couple of minor issues with the thermometer that could stand some improvement, but otherwise the ThermoPop is a high quality and very affordable handheld thermometer. I've Been Giving My ThermoPop Thermometer a Good Workout! My little thermometer has been put through the wringer in the last six months. My Thanksgiving turkeys and turkey breasts had the honor of being the thermometer's first subjects. Using it with the breasts, I verified the reading of my remote Smoke thermometer. I quickly learned that my ThermoPop was a necessity when smoking whole turkeys. The single probe of my remote thermometer, stuck in the breast, gave me no input on the temperature of the thigh meat. A quick check with my handheld thermometer set my mind at ease. When smoking pork loins I take them out of the smoker somewhere in the range of 140˚F - 145˚F. At that temperature, the meat's tender and juicy. Even though the remote probe in the loin's center was showing 145˚, a check with my ThermoPop let me know that one end was still a bit under 140˚. Another 10 minutes of smoking and all was good! I've used it with chickens, a ham, salmon, ribs and brisket, and every time I used it I was happy to have my little red thermometer. It came in handy when brining my turkeys, too. Last Thanksgiving I used a food grade 5 gallon bucket for brining, with an added bag of ice to provide chilling. Submerging the probe tip into the brine let me know that it was still safely below 40˚ Fahrenheit. 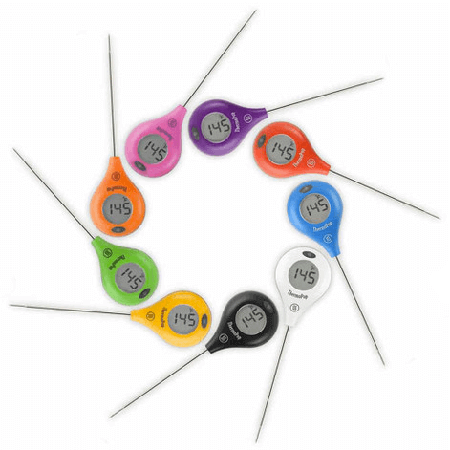 Why Do You Need a Handheld Thermometer In Addition To Your Remote Smoker Thermometer? 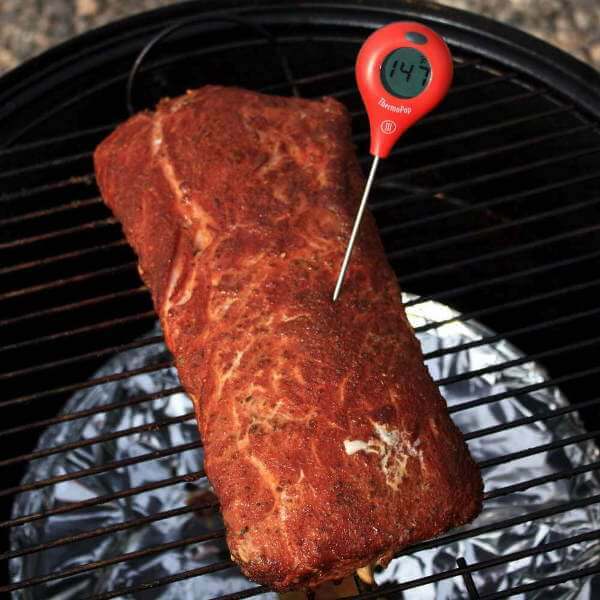 For those wanting consistently great results when smoking meat, using a dual probe smoker thermometer is a must. 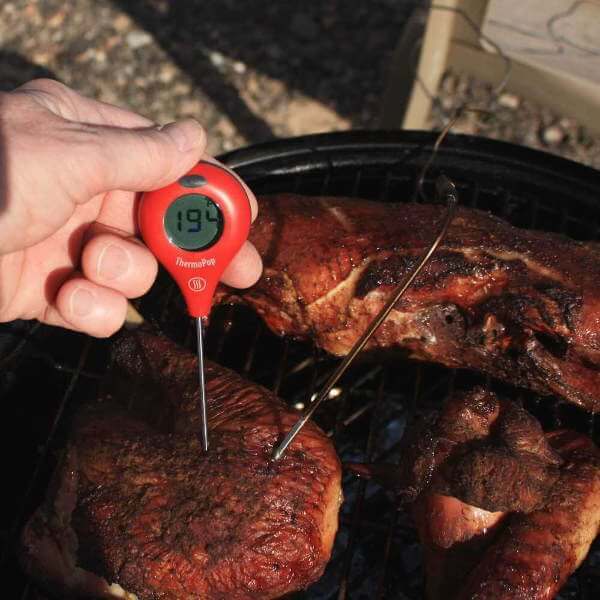 It monitors the smoker temperature so you can make adjustments when necessary. It also displays the meat temperature - but only at one location. 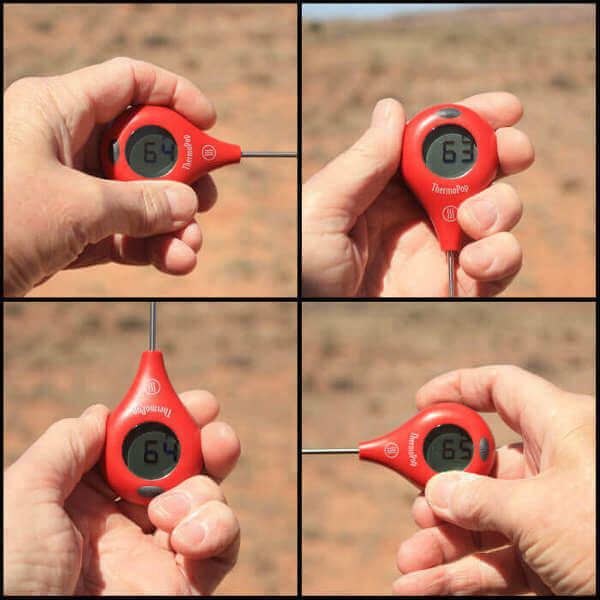 Since the remote's probe only samples temperature in a single location, that's all you have to go by - the temperature in that one spot. A handheld thermometer lets you know the rest of the story. If the temperature inside a smoker isn't the same from one side to the other, briskets and other large cuts could be done in one end, and still not yet finished in the other. Poultry is a whole 'nother story. Even though all parts of a whole chicken or turkey are safely done at 165˚F, most people prefer the legs and thighs when cooked to 175 degrees. They're just better that way. And it often just happens just like that. The breast is higher and positioned above the back. The legs and thighs are lower, with no obstruction blocking the rising heat. The legs and thighs are often 175˚ degrees when the breast reaches 165˚. Using My ThermoPop To See If The Turkey Thigh is Done. Not Yet! But you want to be sure, and that's when a handheld thermometer comes into play. When the breast reaches 165˚ you can quickly check at the leg and thigh with the ThermoPop. It's a good idea to check the breast temperature in a couple of different spots while you're in there, just to be sure. 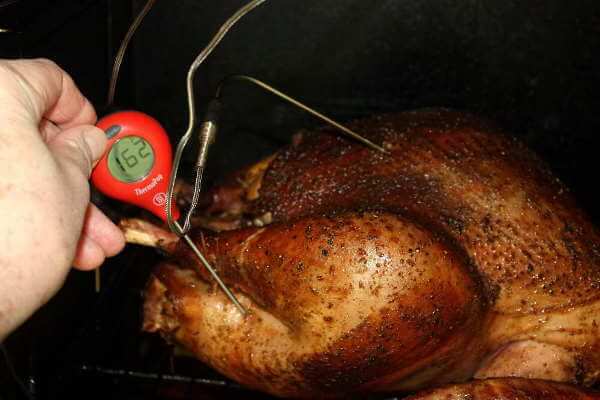 So even though a quality dual probe smoker thermometer is the tool of choice for us smoker cooking fools, a handheld thermometer fills in the gaps, providing information the other thermometer misses. The case is constructed of solid plastic, the front and back sections formed around a firm, rubbery seal. Three flexible buttons (also a rubbery material) are pressed tightly into the hard plastic case. It's rated as splash proof, and I believe it. The steel probe is 4.5 inches long, the tip sized down to a smaller diameter to make penetration easier. The probe is somewhat flexible, and because of its small diameter it seems to be a little delicate, but I've had no problem with it bending. The battery compartment is opened with a coin or key. A few degrees rotation is all it takes. The battery is easily removed and replaced. The battery compartment lid is sealed with a silicone washer. The design of the hard plastic probe sheath impresses me. It's simple, but has a few cool features. What I most like is the way the sheath grips the probe when inserted. There's an "O"ring mounted inside the sheath that provides just the right amount of friction, holding the sheath securely onto the probe. Another feature is the pair of holes at the sheath tip that allow for air circulation. If the probe is still damp when inserted, it won't be for long. Added bonus - a pocket clip is mounted on the sheath. Depressing and holding the Power/Backlight button for one second will turn the display on or off. Like the other two buttons on this thermometer, it takes a bit more pressure than you'd think to actuate them. If you leave your ThermoPop on and walk away, don't worry about the battery running down. This thermometer automatically shuts off after 10 minutes of inactivity. By giving the Power/Backlight button a momentary push the display lights up and remains on for 10 seconds before shutting off automatically. That's a great feature when the sun's dipping below the horizon and your smoking pork shoulder needs another couple of hours to finish. 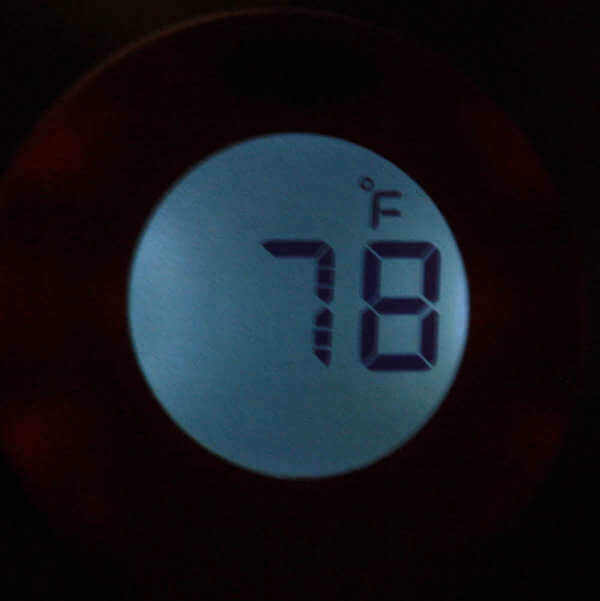 If you need to change the temperature scale, it can be changed with the push of the (˚C/˚F) button. A nice feature indeed! The numerals on the display are over 1/3 inch high and contrast well against the screen color. I've used it in direct sunlight and in deep shade, and could read it with no problem in either lighting intensity. When you cook a lot, your thermometer is used in all positions - sideways, vertically, and maybe even upside down. The ThermoPop display can be rotated with the press of a button, making it readable in any position. Each time the button is pressed the numerals rotate 90 degrees counterclockwise. This feature is really helpful if you happen to be a southpaw! When the display is turned off (either by you or by the automatic shutdown feature), it remembers its last position of rotation when next turned on. 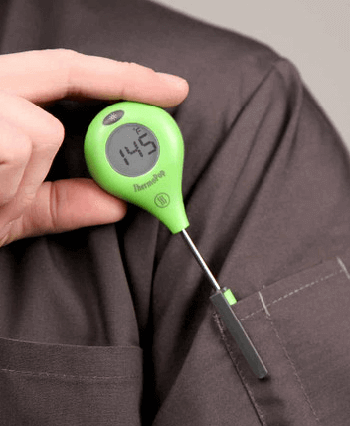 Have You Ever Considered The Ergonomics of a Handheld Thermometer? 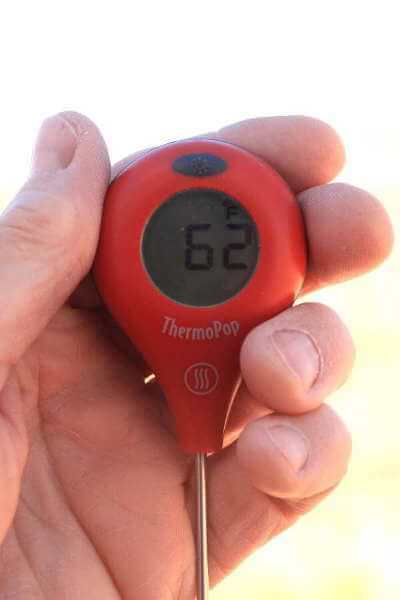 I'd never thought about how a thermometer felt in my hand until I wrapped mine around my ThermoPop. It just feels good to hold. Comforting in some way. The case is teardrop shaped. It's rounded at the top, both front to back and side to side, and tapers at the bottom to a diameter matching the probe sheath. The weight feels right too. Not heavy, but there's enough heft to let you know it's solidly built. A lot of thought went into this little thermometer, from the top of its rounded, ergonomic case to the narrow, easily inserted probe tip. Little touches like the hold-tight probe sheath and the auto-shutoff features (power and backlight) make this thermometer a winner. It feels good in the hand. The display rotation feature makes it usable in any position. Great accuracy, a wide temperature range, big readable numbers and a super fast response time when testing temperature add even more to its value. And the price is right. There are cheaper thermometers, but they don't have the features and the quality of this one. They have a two year warranty. The ThermoPop is built to last! I mentioned earlier that a couple of changes could make this thermometer even better. Something else that would be useful would be a "Hold" feature that would keep a temperature reading displayed until you decide to go back to thermometer mode. The pocket clip is a nice added feature, but because of the heft of the thermometer body it tends to wobble around in my shirt pocket. At times I'm afraid it'll fall out. If the pocket has a pen slot sewn in it would stay in place securely. It's not a big issue. Just something I've noticed. I decided on the ThermoPop TX-3100-RD, (RD is code for red) because it matches my bright red electric smoker! And as you can see, there's a wide range of colors available that'll match meat smokers of any hue! You could get one of every color - buy five or more and the price is discounted $5 off each. They make great gifts for the food lovers in your life! My ThermoPop arrived by UPS, shipped in a solid cardboard box. The thermometer itself was nicely packaged and secured in a thin molded-plastic insert that held the thermometer and probe sheath firmly in place. A ThermoPop instruction sheet and an informative "Chef Recommended Temperatures" chart was included. The battery was pre-installed, and to top it all off I was pleasantly surprised to find a little packet of Jelly Belly Jelly Beans included with my order. Sweet!